Google Maps implemented its own "universal search" by mixing personalized maps and KML files with standard local results. Depending on the query, you could see a group of up to three community results individualized on the map using blue pushpins. Until now, these user-created maps were displayed if there weren't relevant business listings for your query, but now they're a part of the standard results. 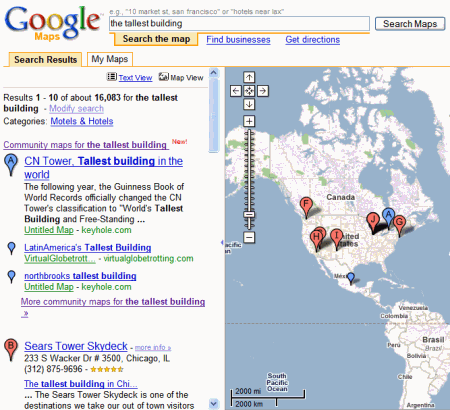 "The blue markers ('community maps') indicate relevant user-contributed results for your search. You can click on the 'see more community maps' link either in the community box or at the bottom of the page to see more user-contributed results," explains Google. Google includes in the search index all the public personalized maps, but also geolocated content from the web: GeoRSS feeds and KML files. So you'll be able to find Flickr photos that have a public location or news from topix.com. The index is far from being comprehensive, so it would be nice to see in Google Maps all the content from the web related to a location: photos, videos, news, blog posts, events. hey guys; you know what would really be great ? you know, you write an article about an event and then you just google map the event on a map. so you'll have both a kml feed made thru de rss feed and also time et geolocated dot on your map..
Really would be great.. I'm trying on each of my post to add to my own kml map the event but this taking time end energy.. would be so much easir to choose the place from an embedded google map in the wysiwyg editor..
thnks for you work anyway..
Ionut, do you know if Google Maps (the "Map" view, not Satellite) is made using images or some type of calculation graphics (vector-based and generated on the fly). Just curious, but I wasn't able to find this info elsewhere. Google Maps uses 256x256 PNG tiles for each zoom level. The tiles are created from vector data once and served from a cache. I remember reading about this, but I don't know where. Google Maps API Documentation could include some details about this.